+ Stella Maris +: Angels are Real! On the whole (putting it mildly!) Catholics know very little about angels. In fact, some Catholics (including some priests!) do not believe that Angels are real beings. My own knowledge of the teaching of the Church in this area is poor (I am working on it). Since being appointed a diocesan exorcist about eleven years ago, I have had to learn about demons and also about angels. I was not told anything about angels when I was at seminary, and I suspect there are many priests, ordained after me, who know almost nothing about them. The Fourth Lateran Council declared the existence of angels to be an article of the Faith. It is therefore not an optional belief for loyal Catholics. When I was ordained (1975) I thought I knew pretty much all there is to know about such things. I thought angels were some kind of "divine expression" or had something to do with religious experiences, but that angels were not real beings. Of course, as time went along, I learned that I knew much less than I thought (about many things). Becoming an exorcist especially meant that I had to read, and much of my information has come from Evangelical writers who are not embarrassed by some things in Sacred Scripture and who (truth be told) often present a more accurate version of the Catholic Faith in certain areas than some Catholic writers. "The rank of the angels is determined by the amount of the gifts that God has given them, and according to the office assigned them. Nearest to the Throne of God are the seraphim, who burn more than the rest with the love of God; next to them are the cherubim, who are distinguished by the vastness of their knowledge. 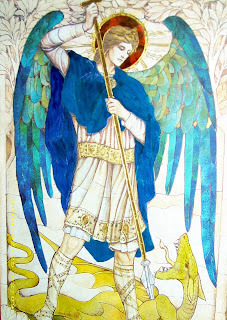 We also read in Scripture of thrones, dominations, principalities, powers, and also of three archangels, St. Michael, St. Gabriel and St. Raphael. There is also a corresponding division among the fallen angels". The more I think about the richness of the Catholic Faith these days, the more I am saddened and even appalled at the impovershment of our catechesis over the last 30 or 40 years. I am thinking not only of doctrinal matters, but about our moral teaching. There are now great numbers of Catholics who live with "partners", as opposed to wives and husbands, and who see nothing wrong in this. They come to Holy Communion as and when they like (because the Sunday obligation has also "gone"). Superstition has remained in different forms, and worldy wisdom has overshadowed the wisdom of the Scriptures and Catholic Tradition. How long can this go on? I must admit that without prayer I would be tempted to despair of the Church in the West. "I must admit that without prayer I would be tempted to despair of the Church in the West"
Since starting to say the Rosary,my Catholic faith is being renewed.I had started to follow an independent type of self styled spirituality and was certainly becoming lukewarm to say the least regarding morals and Catholic teaching.It was misery and a sense of hopelessness that drew me back,rather than any goodness on my part.Thank God,He accepts our filthy rags of a return and restores the years the locusts have eaten.Our Lady is a gentle teacher,but doesn't suffer fools.She means business,I am finding.Please God,I will remain faithful.